Last week the pair GBP/USD traded with high volatility. On the one hand, the Pound was supported by the growth in the UK GDP by 1.9% on annual basis; on the other hand, balance of trade deficit increased up to 20.7 billion pounds in Q3, not justifying forecast for decline. Amid these facts the “bulls” managed to raise the pair GBP/USD up to the weekly highs at the level of 1.6395. However, appetite of the Pound’s buyers was spoiled by US macro-statistics. It became known that US GDP rose by 4.1% in Q3 against expectations of 3.6%, which is the highest level since Q4 2011. On the four-hour chart technical indicators give mixed signals. MACD histogram is in the positive zone, its volumes are decreasing, giving a weak sell signal. 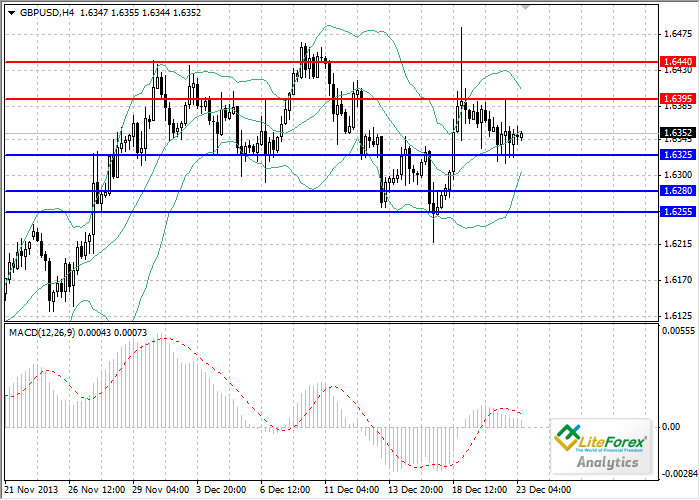 Resistance levels are 1.6395 and 1.6440. Support levels are 1.6325, 1.6280 and 1.6255. If downtrend continues, it is recommended to open sell positions with profit taking at the level of 1.6280.